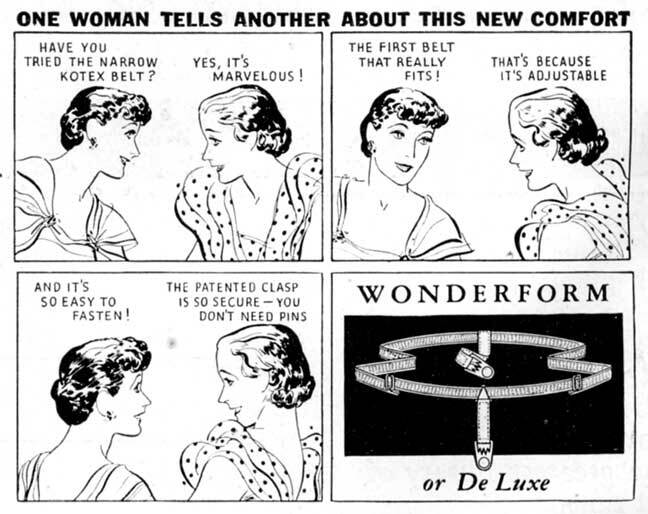 1932, Phantom Kotex - leaflet ad for Wondersoft pads, belt, Marjorie May's Twelfth Birthday, 1933 - 1933, Phantom Kotex - box and pads, 1930s? 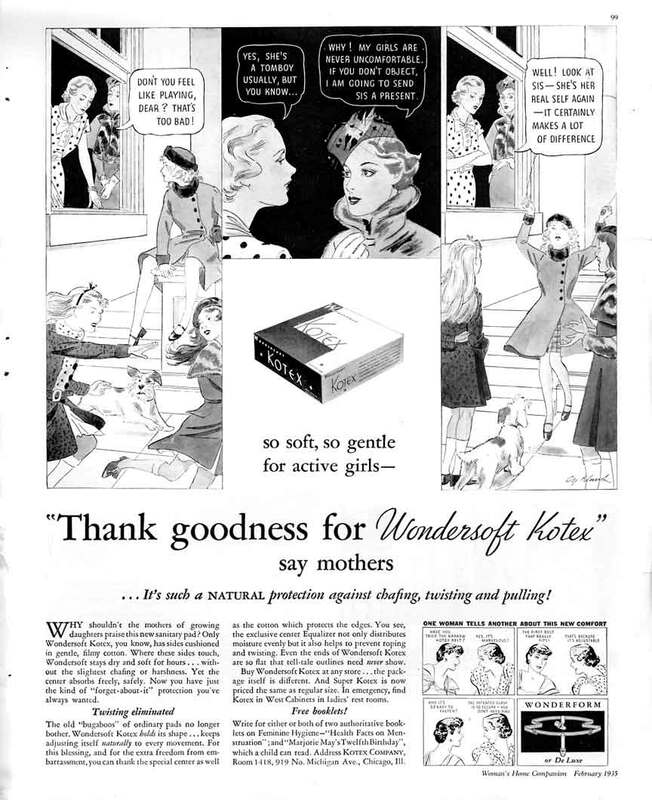 - wrapped Kotex pad for West Disinfecting Company dispenser (mid 1930s) - Two ads on a sewing pattern for women's sports trousers, 1930s - "Cooperation," publication for Kimberly-Clark employees, 1931-34, jokes, sports, gossip, etc. The ad promotes what Kotex and other companies promote and promoted for decades: comfort and absorption. Pads of the era were not the thin things women wear today; they were often enormous. Faces in ads also differed: there's no hint of blacks or Latinos or fat or ugly people. Menstrual product advertising would show middle-to-upper class white women for the next several decades, often with a certain face. Blacks are servants. But this was typical throughout American publications. I thank the contributor of this and many other items! or at least had fast women. They dressed so well then. and a Marjorie May booklet probably similar to this contemporary Canadian version. periods or their gear with one another. But maybe an earlier era was different. Below: I Googled in vain for the illustrator - signature below, which looks like Cy Klunok or Klunak. I suspect he illustrated for many companies. "Cooperation," publication for Kimberly-Clark employees, 1931-34, jokes, sports, gossip, etc.